Whether you're new to making candles or you're considering expanding to a new technique, having the right supplies is essential. From wax and wicks to melting supplies and additives, there are lots of tools and ingredients that go into a great batch of candles. Depending on the type of candle you plan to make and the supplies you may already have on hand, you'll need some or all of the following items. Raw Settled Beeswax - Available by the pound from Brushy Mountain Bee Farm, this wax has been settled (or melted) to get rid of any impurities. It comes in block form, which you can then melt down as desired. This wax retails for just under six dollars a pound. Translucent Paraffin Wax - You can purchase translucent paraffin wax from CandleScience by the 10-pound slab. 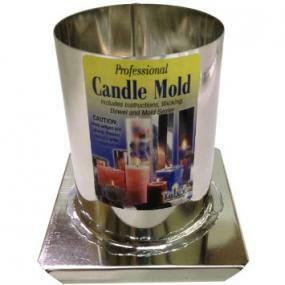 This is a great choice for making pillar candles or chunk candles, as well as votives and tarts. A slab retails for about $17. 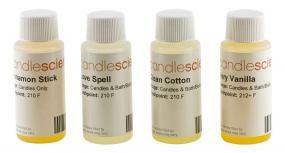 Soy Wax Sampler Set - A great way to try out your options when making soy candles, this sampler set include three different popular soy waxes from Candlewic, as well as several different types of wicks. You get five pounds of each type of wax for about $18. Cotton Core Wicks - Rustic Escentuals sells cotton core wicks, which they recommend specifically for making soy candles. You can purchase any size from votive to those for 3.5-inch diameter candles. A pack of 100 wicks costs about seven dollars. Wooden Wick Sampler Kit - Wooden wicks offer the crackle of an open fire and the charm of nature. They're a great option for many kinds of candles. You can purchase a sampler set with a dozen wood wicks in several different sizes from Lone Star Candle Supply for just under five dollars. Paper Core Wicks - Paper wicks have the advantage of a cooler burning temperature. Available in 100 count packages, these wick are priced around $8 to start. Liquid Candle Dyes - Synthetic dyes give your candles a vibrant color, and they are affordable. These dyes from Cajun Candle & Soap Making Supplies come in a wide range of shades, including red, blue, green, yellow, orange, black, and more. A one-ounce bottle of any color costs about $5.50. 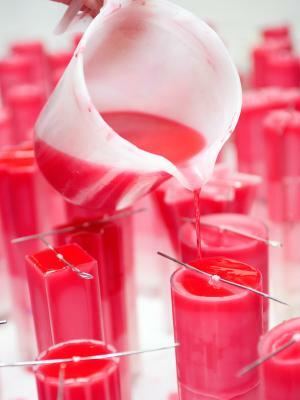 Candle Dye Chips - Another great option for coloring your candles is dye chips. These solid synthetic chips from Cierra Candles melt in your hot wax and give your candle the color you want. They come in dozens of different colors. A pack of 12 chips retails for under two dollars. Solid Candle Colorants - Solid dye blocks are another way to add color to your candle. You add the solid dye and allow it to permeate through the melted wax. These blocks from Brambleberry come in a number of different colors, including black, blue, red, green, and more. Each block will color about five pounds of wax and retails for just over one dollar. You may also want to give your candle a scent, and there are lots of great options for this. You can buy fragrances for candle making from a number of different Internet retailers, including highly concentrated fragrance oils. Some candle makers also prefer to make soy candles with essential oils, or natural substances that provide a beautiful scent. Molds allow you to customize the shape of your candle. You pour hot wax into the mold, where it solidifies and takes on the desired form. You can purchase unique mold shapes like seasonal or holiday motifs, or you can go with standard votive candle molds or molds for taper candles. Choosing the right mold for your project is all about the end shape you desire. Tealight Cups - If you're making tealights, these polycarbonate cups from Cierra Candles are affordable and easy to use. At 15 cents apiece, they are a great bargain. Glassware, Bottles, and Jars - You can find hexagonal jars with lids, tall glass cylinders, and many other options at Cajun Candle & Soap Making Supplies. These containers come in any size you need and are sold by the case of 12 or 24. Most cases retail for about $12. Candle Tins - You can make simple travel candles using candle tins. These metal containers from Brambleberry offer a great value. They have a tight-fitting lid and hold a candle that is about 5.5 ounces. They retail for $1.25 each. 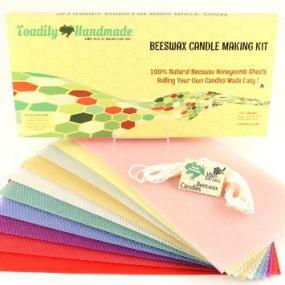 If you don't want to purchase supplies separately, you can always buy your candle making items in kit form. There are a variety of shopping options for candle making kits, whether you make soy candles, traditional paraffin candles, beeswax candles, or another type. You'll also need specialized candle making equipment for your project. The equipment needs will vary by the type of candle you make, but most candle makers use pouring pots, scales, and thermometers. You'll also want dedicated pots and stirring utensils. Having the right supplies will make any candle project a success. Examine your candle making instructions or recipe carefully to determine which specific items you'll need. If you have these supplies on hand before you start, you'll avoid frustration and ensure your candles turn out beautifully.